NMJACL is currently involved in a broad series of initiatives aimed at documenting, educating, and raising awareness of the internment of Japanese-Americans within the state of New Mexico during World War II in Department of Justice concentration camps. The chapter has been the recipient of numerous grants from grantors such as the National Park Service, the Pacific Southwest District of the JACL and the New Mexico Humanities Council. 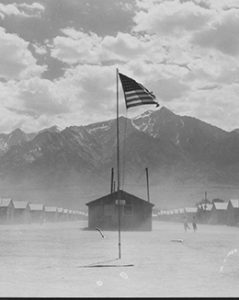 The goal of “Confinement in the Land of Enchantment: Japanese Americans in New Mexico during WWII” (CLOE) is to reach a wide and diverse audience of New Mexicans and Americans about the histories of Japanese internment in the state, and to inspire thought and conversation about issues of citizenship, identity, and civil liberty. The project focuses on the stories of World War II Japanese confinement sites that were located at Santa Fe, Ft. Stanton, Old Raton Ranch (Baca Camp), and Camp Lordsburg in New Mexico. In addition to telling the stories of detainees held at each of these facilities, the project examines how the surrounding communities interacted with these camps. Stories of how various communities across New Mexico treated their Japanese and Japanese American community members are also explored. To ensure sustainability, the project will complete web pages that document the history of the New Mexico camps, experiences of detainees, and the effects of the camps on the surrounding New Mexican communities. The web pages will be hosted by the New Mexico Office of the State Historian, which is the official history website of the state. The website content and design will be developed through collaboration between the State Historian and the project planning board and will include video, interactive maps and timelines, and historic photos. A professionally published public outreach brochure that includes a historical context, brief camp histories, and stories of internees and community experiences at and near the New Mexican camps has been produced. It will include historic photographs, excerpts from oral histories, and other new and exciting research. The outreach publication will be distributed to elementary and high schools and public libraries across the state. As of June 2017, Initial copies have been provided free of charge to schools and museums in New Mexico. The project was funded in large part, by a grant from the National Park Service, Japanese American Confinement Sites Program. Copies from a second printing will be available for purchase. Please contact info@nmjacl.org for more information on how to purchase a copy. Historic markers for Camp Lordsburg and Ft. Stanton have been developed by the planning board, Van Citters Historic Preservation, and cooperating partners. Although Santa Fe already has a memorial marker in place, the team is considering installing a more visible roadside marker to help reach a wider audience. Because the original Camp Lordsburg site is located on private property, the Camp Lordsburg marker will be placed in the City of Lordsburg. The Ft. Stanton marker will be placed on the Fort property. A marker at the site of the Old Raton Ranch is currently being considered by the project planning board. Make a check payable to "New Mexico Japanese American Citizens League"
On the memo line of the check, please indicate that the donation is for "New Mexico Japanese American Citizens League"